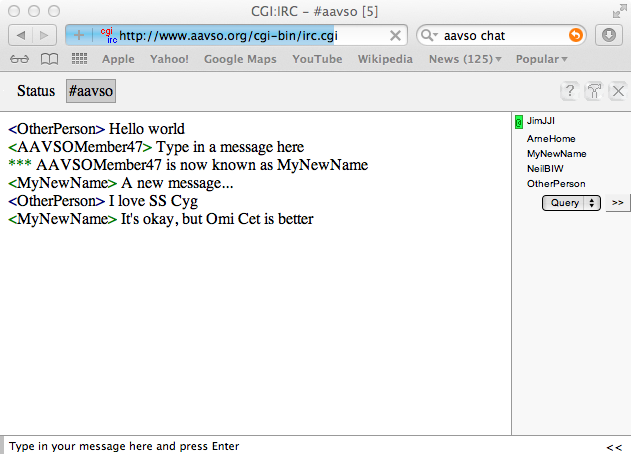 The AAVSO maintains an IRC-style chat room for use by their members and other variable star enthusiasts. We usually host special guest chats once every couple of months or so. Monitor the AAVSO home page for announcements or click here to search our web site for chat-related news posts and web pages. There are many ways to access the chat room. Colloquy - This is a very good and easy-to-use client for Macintosh OS X and iOS (iPhone, iPad) devices. ChatZilla - Provides all the usual IRC client features but does not work with Firefox "Quantum" browser. XChat is an IRC client that works on many different platforms including Windows, OS X and Unix. All of these clients will want to know your server, channel and nickname. Use the information in the list above. Some may also ask for a port number, which is 6667, or a URL, which is irc://irc.aavso.org. Usually there are a few people "hanging out" in the chat room at a given time - especially in what would be evenings for North America and Europe. However, people don't monitor the room 24/7. When you post a message, it may take seconds or a few minutes for a reply. Typically activity comes in bursts, with rapid discussion for 5-10 minutes separated by longer periods of quiet. IRC commands are usually preceded by forward slashes, which have to be the first character in the chat window. For a list of commands you can use, type /help and press Enter. Participants go by nicknames or "handles" in the chat room. For the AAVSO chat room, tradition has been that you use your name followed by your observer initials. Example: ArneHQA, AaronPAH... Most clients have a button you can click to change your nickname. But you can also do it from the chat room itself by typing: /nick YourNewName . IRC chat rooms are usually divided into two windows. One large window shows what other people are saying. The smaller window is for you to type in your message. Your message will not be displayed to the room until you press Enter. Again, most clients will have buttons that can do this as well. The same behavior rules apply to the chat room as to the AAVSO Discussion List. We reserve the right to restrict access to the chat room to anyone who violates the rules or causes trouble for other users. Have fun!